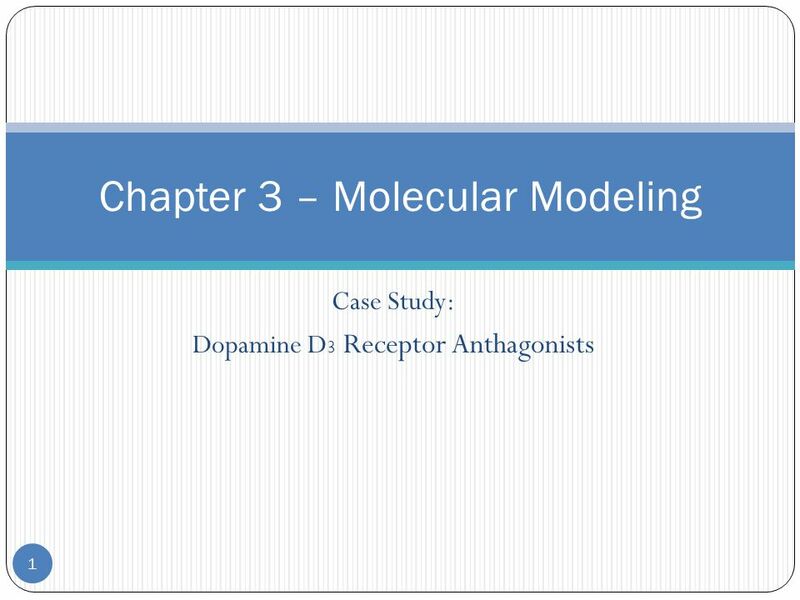 Case Study: Dopamine D 3 Receptor Anthagonists Chapter 3 – Molecular Modeling 1. 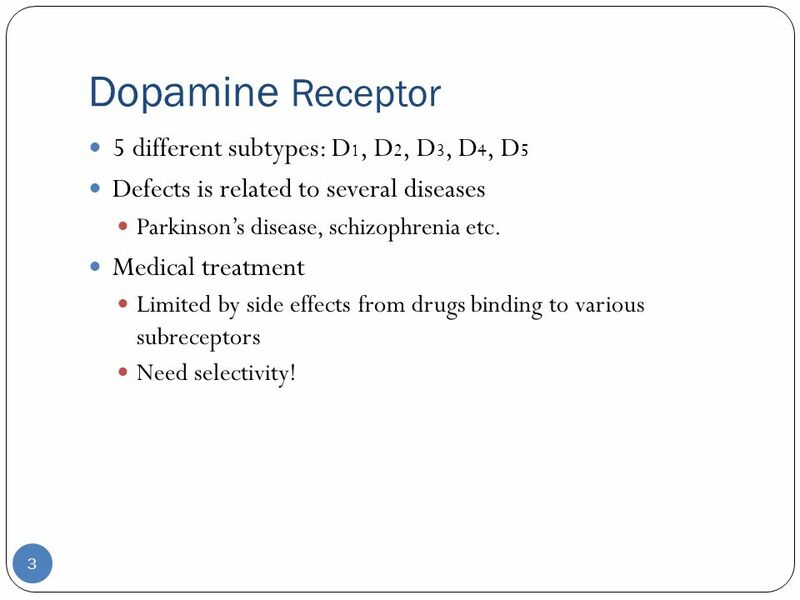 3 Dopamine Receptor 3 5 different subtypes: D 1, D 2, D 3, D 4, D 5 Defects is related to several diseases Parkinson’s disease, schizophrenia etc. 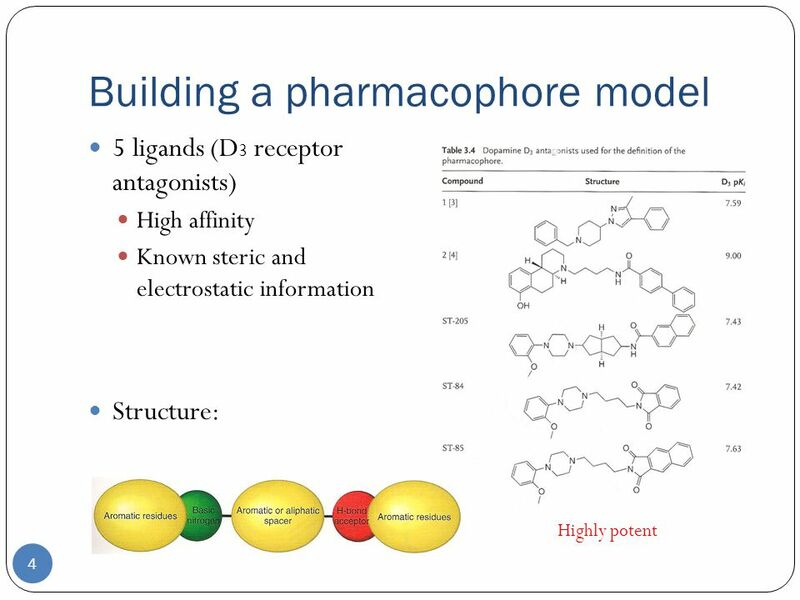 Medical treatment Limited by side effects from drugs binding to various subreceptors Need selectivity! 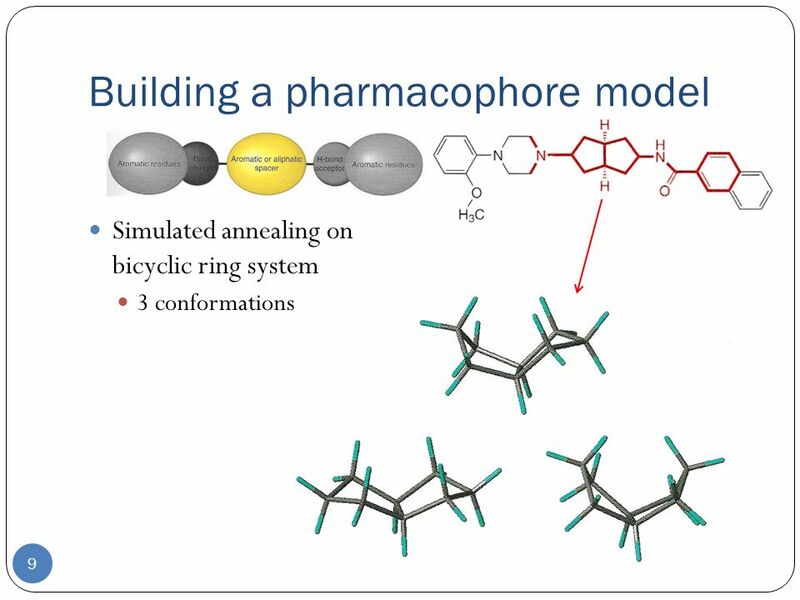 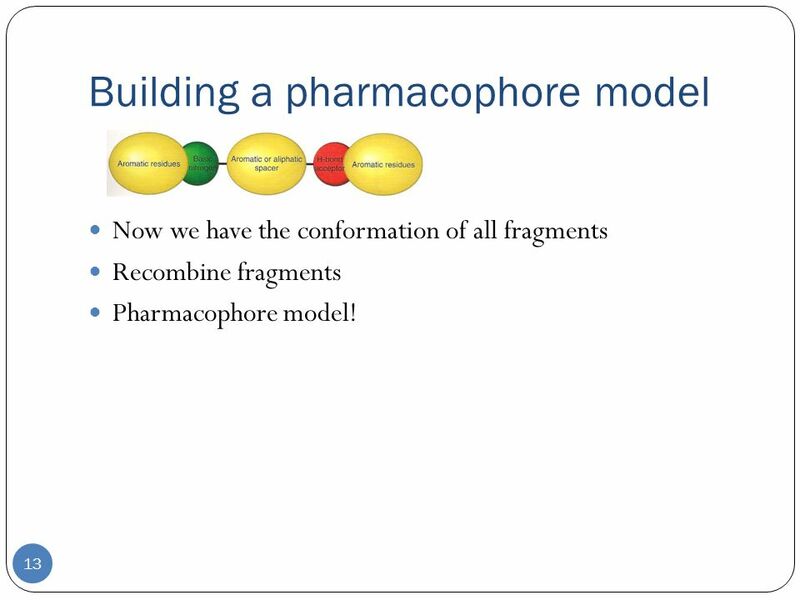 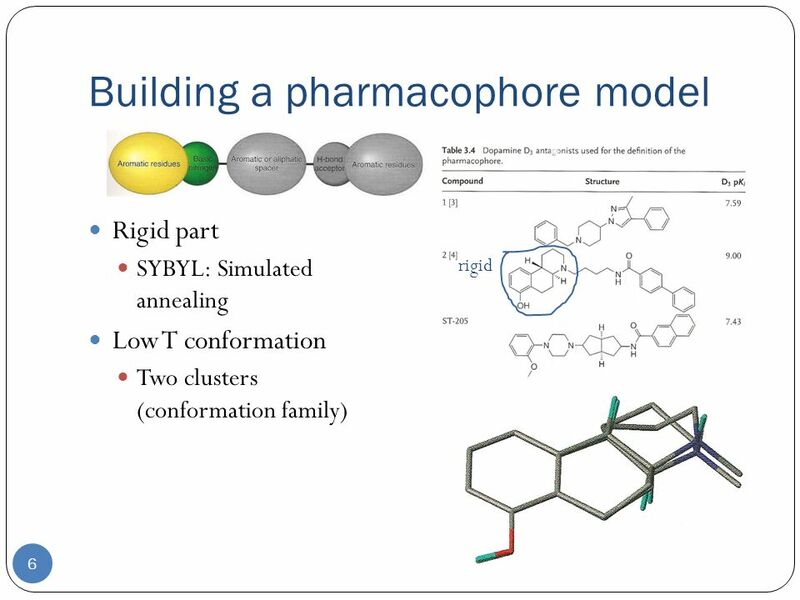 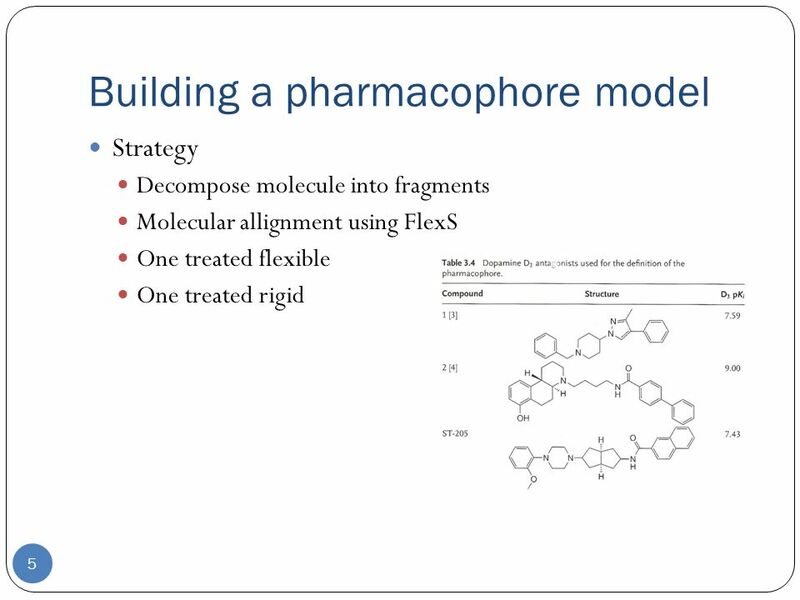 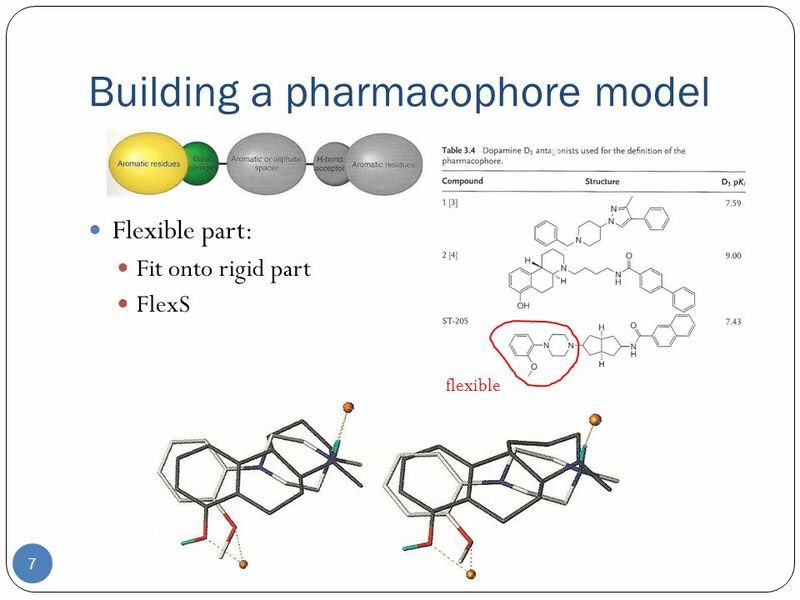 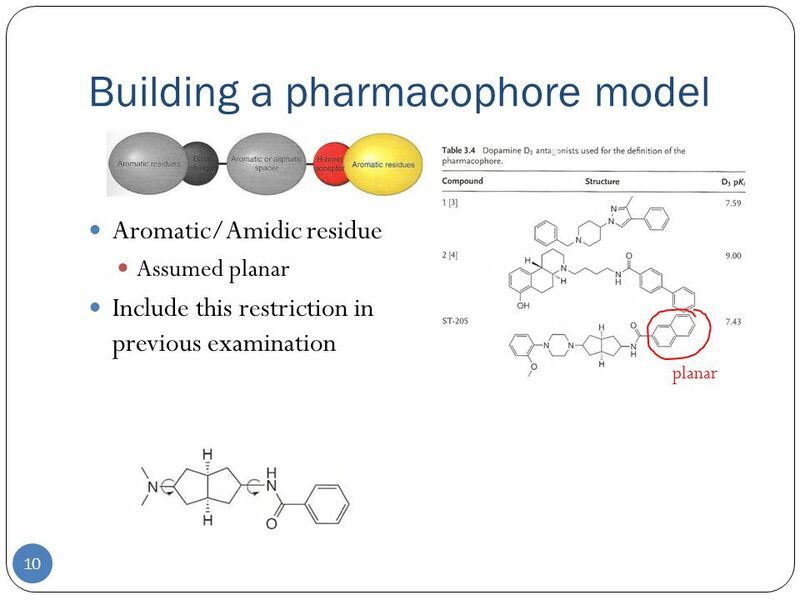 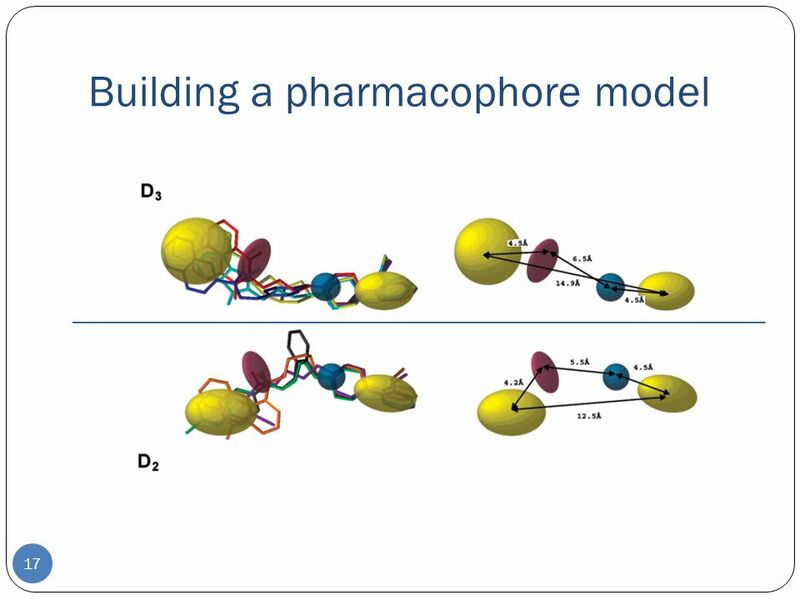 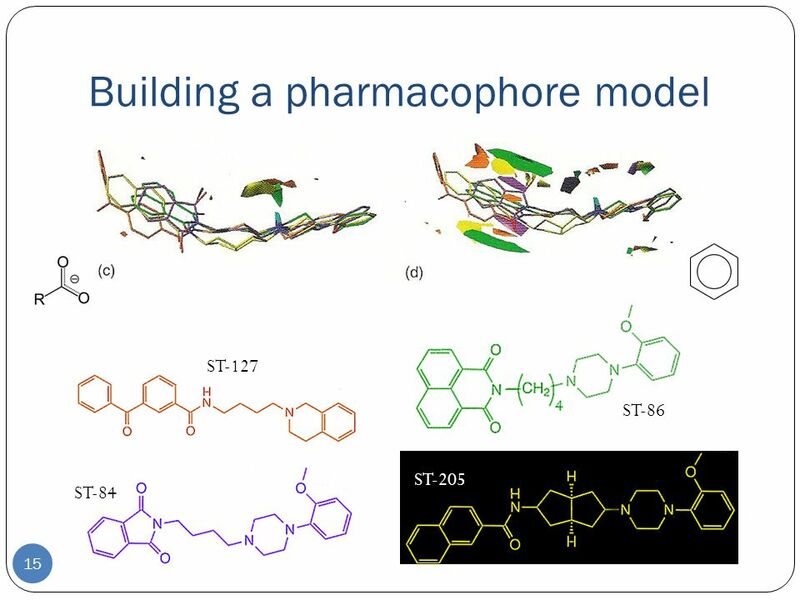 13 Building a pharmacophore model 13 Now we have the conformation of all fragments Recombine fragments Pharmacophore model! 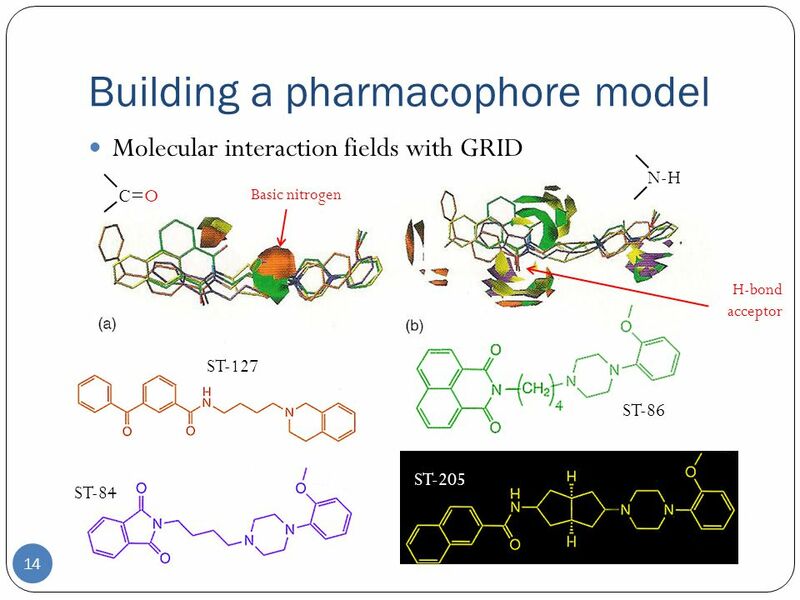 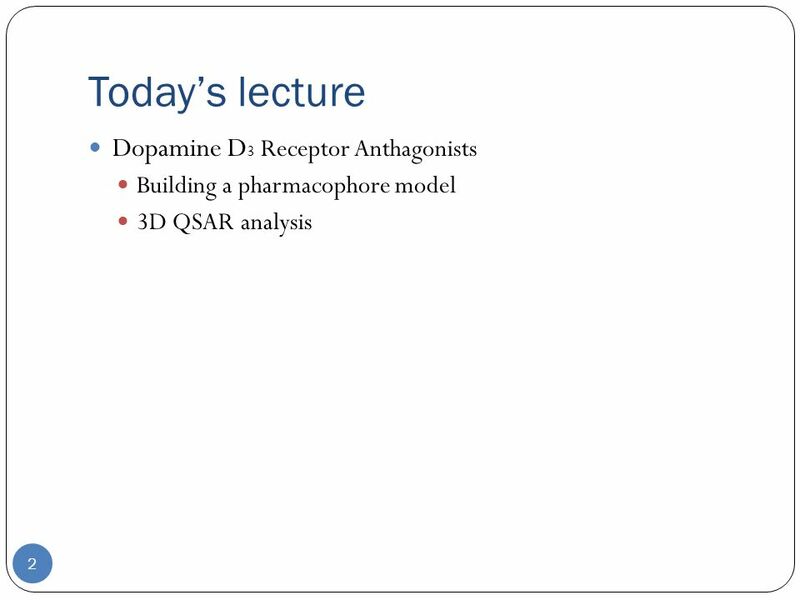 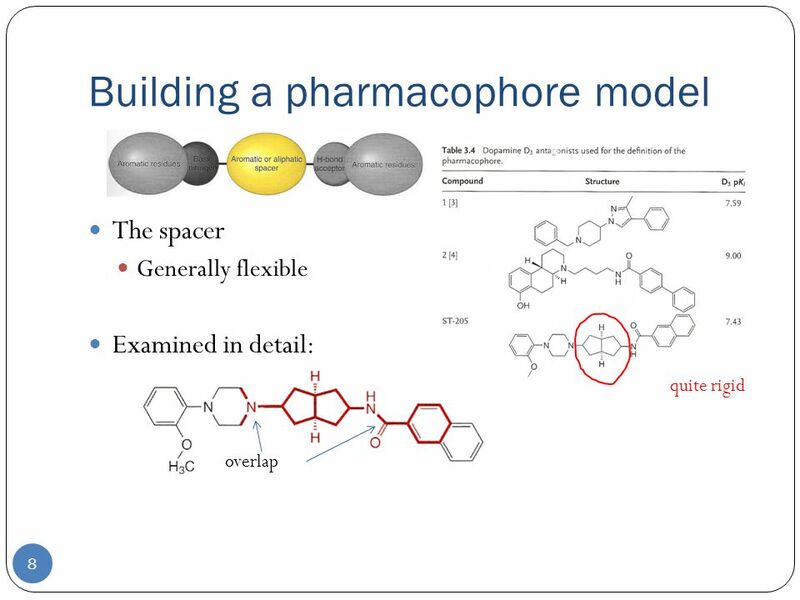 Download ppt "Case Study: Dopamine D 3 Receptor Anthagonists Chapter 3 – Molecular Modeling 1." 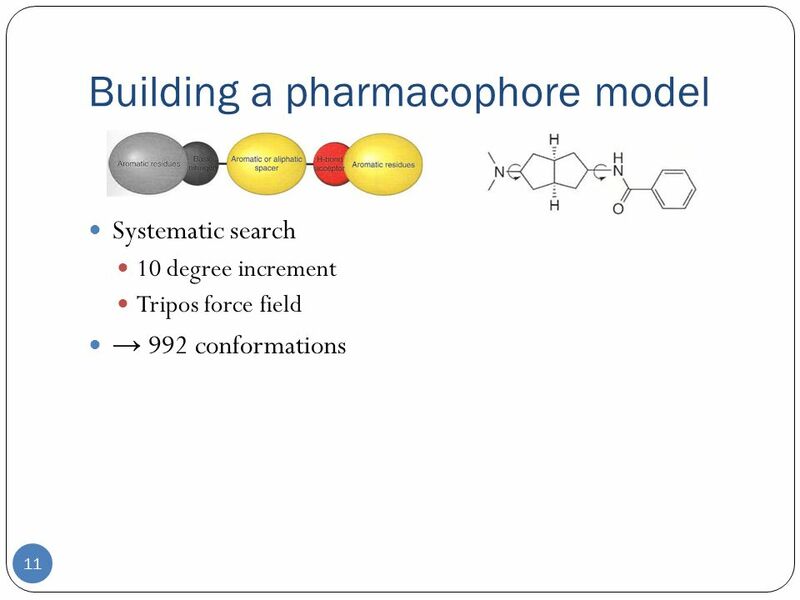 Computational Drug Design Apr 2010 Postgrad course on Comp Chem Noel M. O’Boyle. 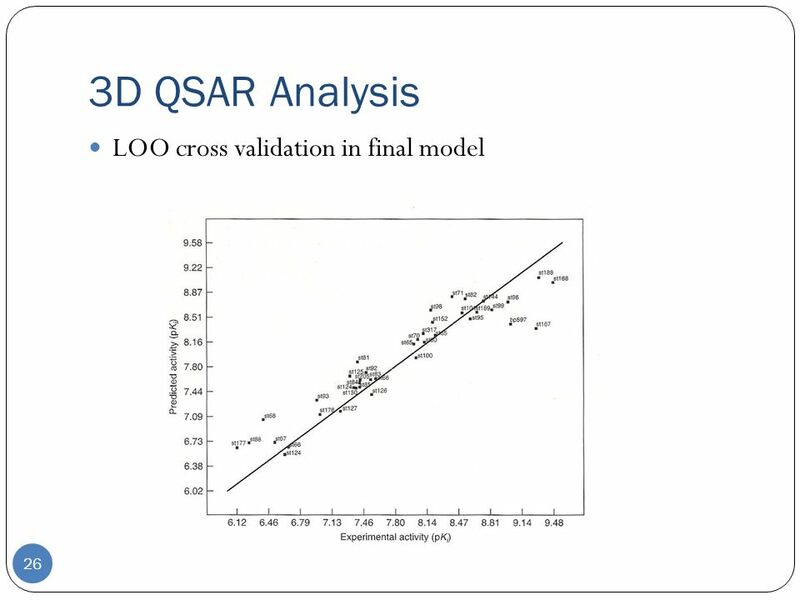 Applications and integration with experimental data Checking your results Validating your results Structure determination from powder data calculations. 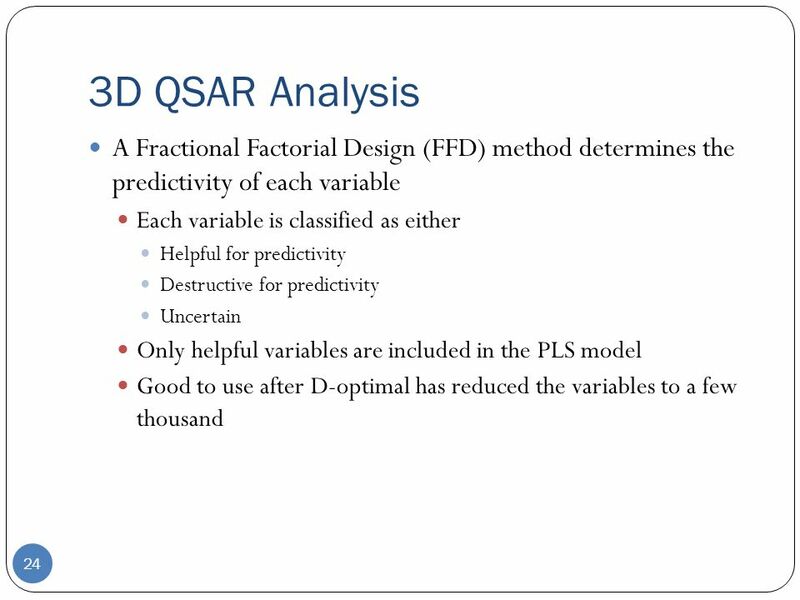 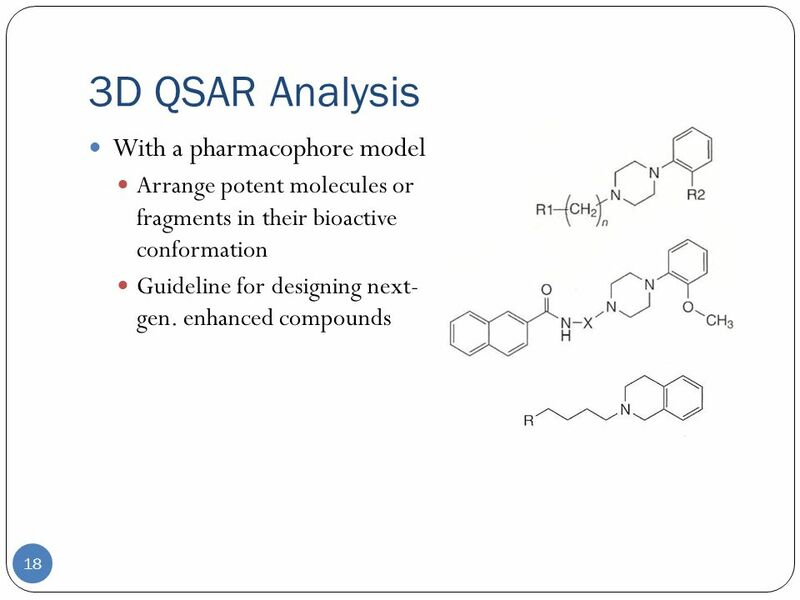 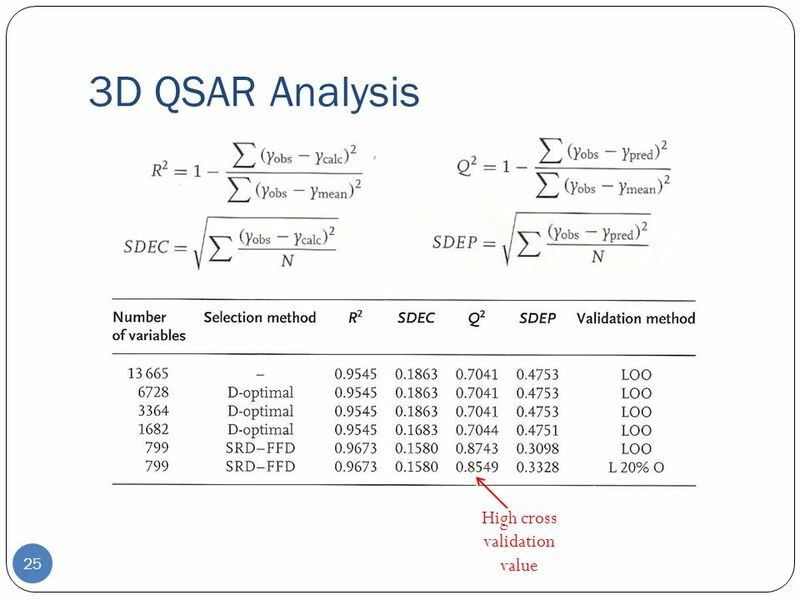 6th lecture Modern Methods in Drug Discovery WS07/08 1 More QSAR Problems: Which descriptors to use How to test/validate QSAR equations (continued from. 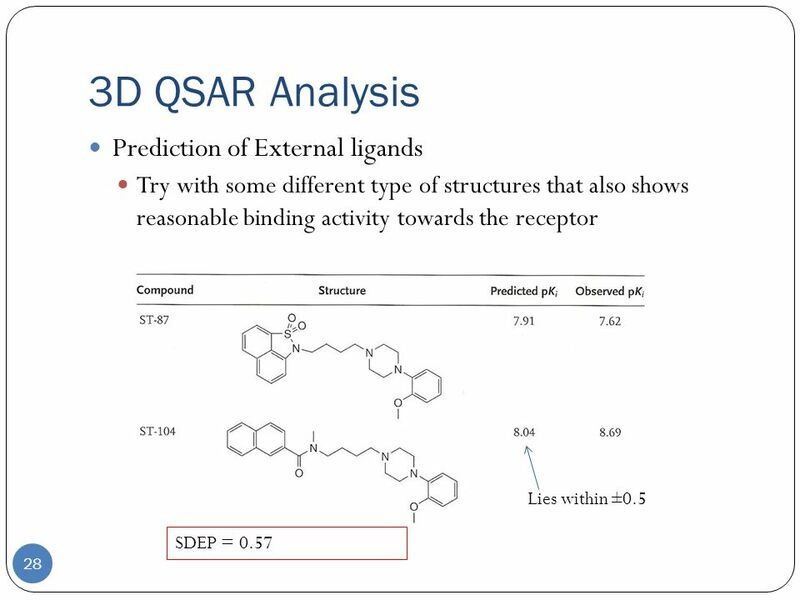 Recap: Intermolecular forces and binding Overview of classes of targets for drugs Quantitation of Drug activity (functional assay) EC 50, ED 50, IC 50. 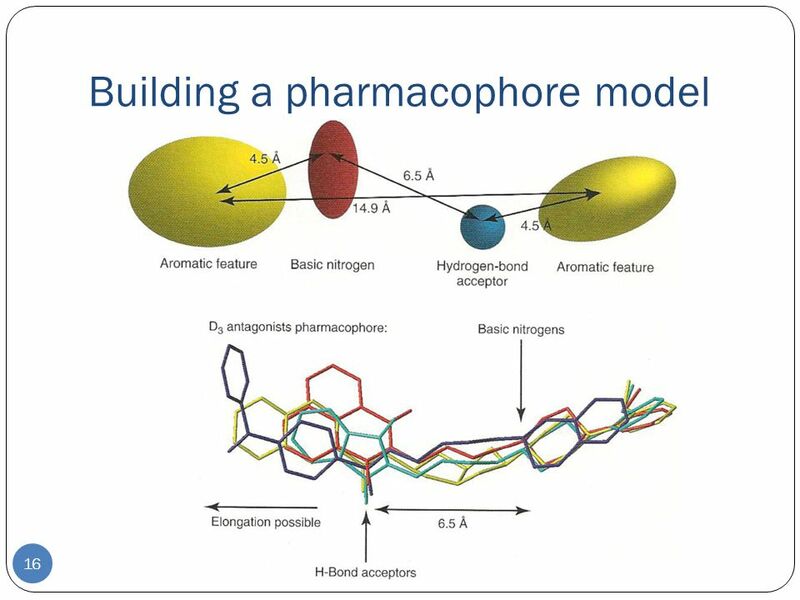 Protein Docking and Interactions Modeling CS 374 Maria Teresa Gil Lucientes November 4, 2004. 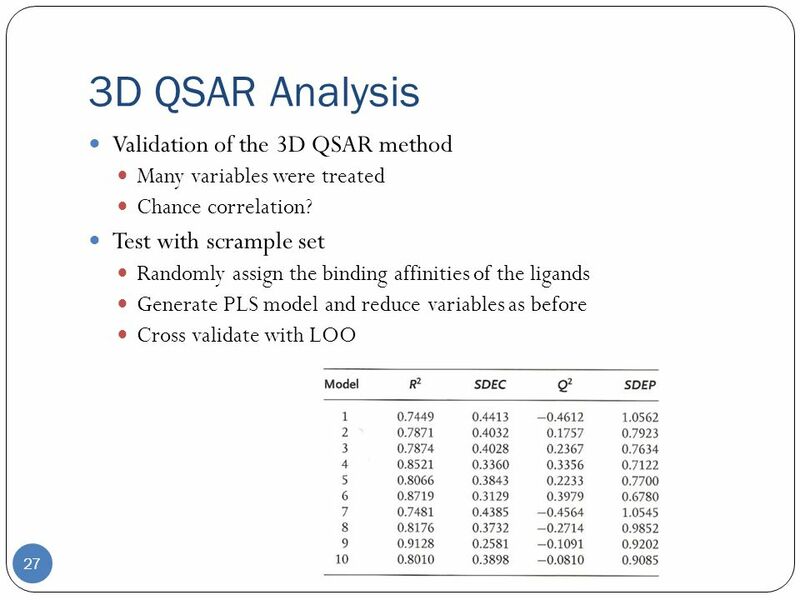 Summary Molecular surfaces QM properties presented on surface Compound screening Pattern matching on surfaces Martin Swain Critical features Dave Whitley. 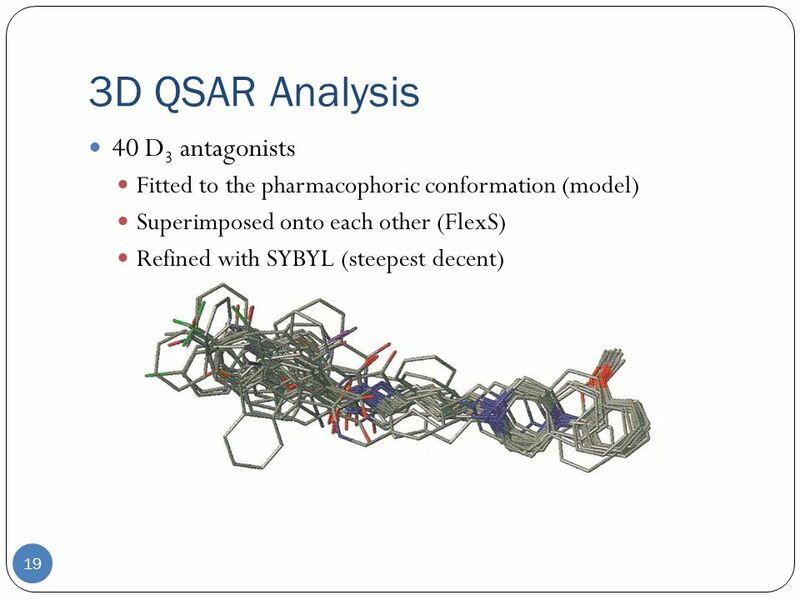 M. Wagener 3D Database Searching and Scaffold Hopping Markus Wagener NV Organon. 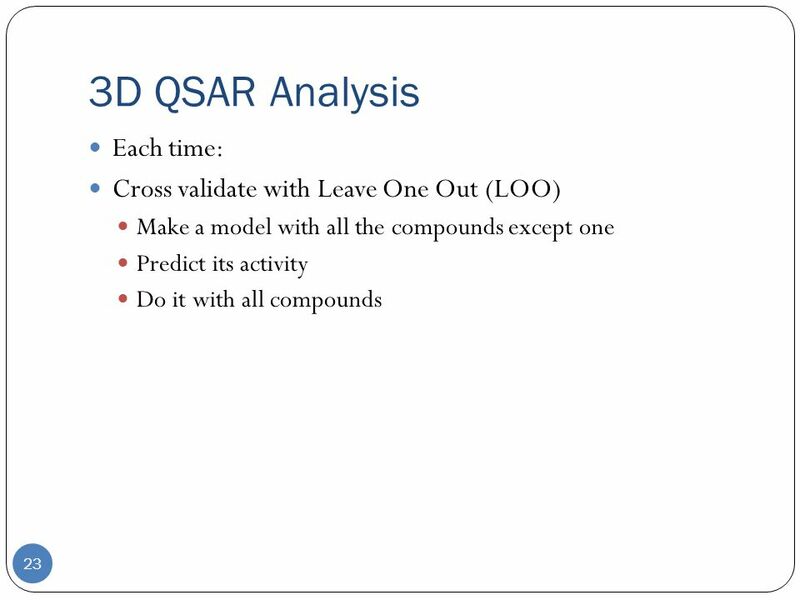 Quantative Structure- Activity Relationships. 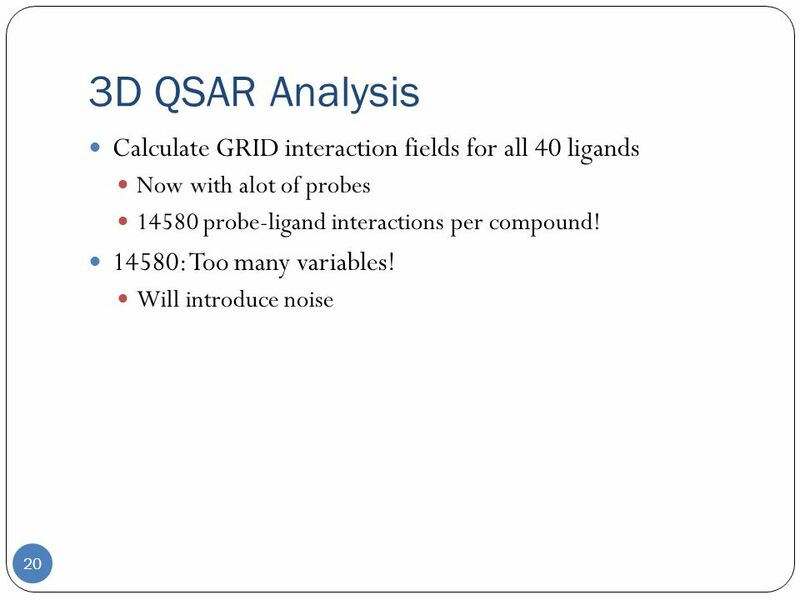 Why QSAR? 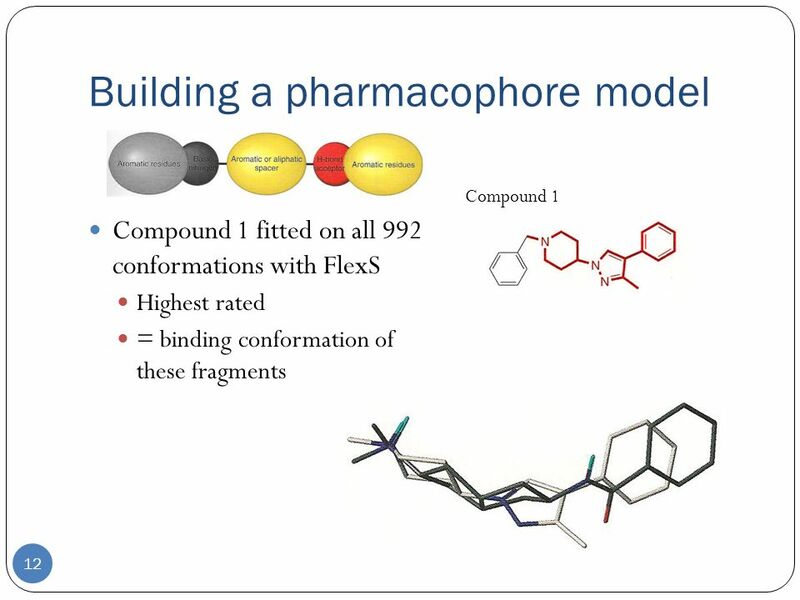 The number of compounds required for synthesis in order to place 10 different groups in 4 positions. 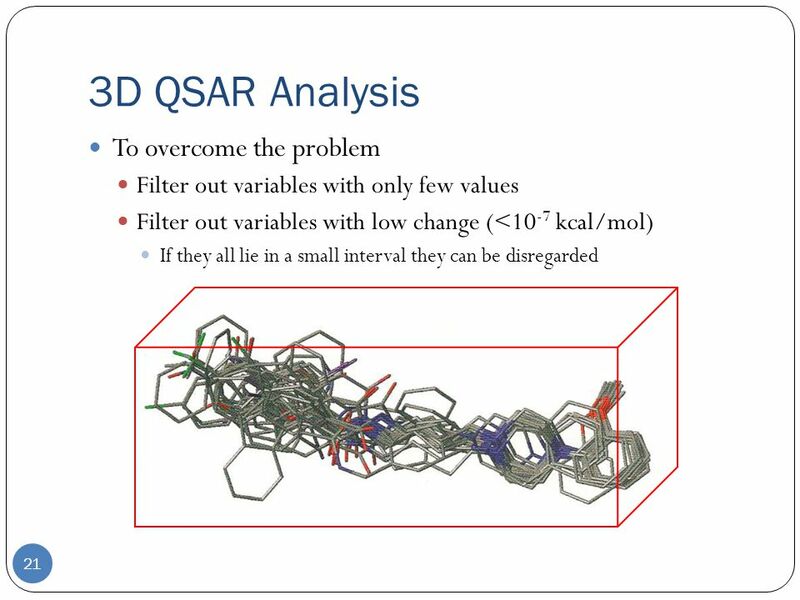 Quantitative Structure-Activity Relationships (QSAR) Comparative Molecular Field Analysis (CoMFA) Gijs Schaftenaar. 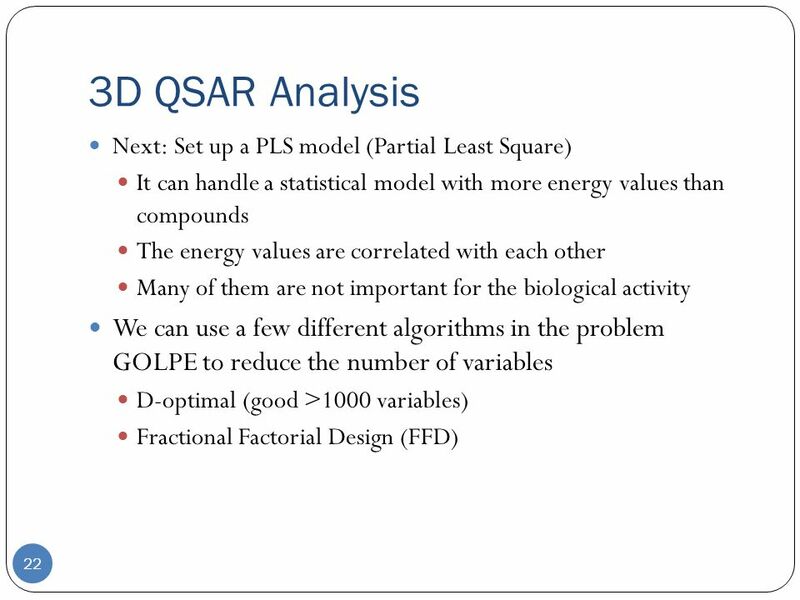 Bioinformatics IV Quantitative Structure-Activity Relationships (QSAR) and Comparative Molecular Field Analysis (CoMFA) Martin Ott.